Rie Nakajima, Cyclic (detail), 2018, mixed media, dimensions variable. A breathing bag sighs as it inhales. Electric nodes chatter while whistles jump up against the walls, like fleas. A spinning stone shudders against a metal sheet. For her first solo show, sound artist Rie Nakajima sets off a series of small machines made from everyday found objects in her installation Cyclic, 2018. The devices are set apart on the walls, hanging from the ceiling, or grouped on the floor in little islands. The effect seems amusing until the observer slows down and listens to their private conversations. It is revelatory that things so small and simple can possess the top floor of this imposing Victorian building. The installation has a casual ease about it. This belies its meticulous preparation, however. The artist sourced her materials locally and studied the site’s architectural properties and layout meticulously. “The process of making is to observe what is not right, and remove it, or to observe what is right, and to leave it,” Nakajima states in the exhibition notes. The work is experimental and self-contained, objects with their own agency and actions that resist a tidy conceptual overlay. The exhibition effectively transposes to a museum setting some of the ambiance of Café OTO (the word for “sound” in Japanese), a contemporary sound-art venue in London’s East End. In events linked to the café, performances are planned with a distinguished list of collaborators, including David Toop and David Cunningham. 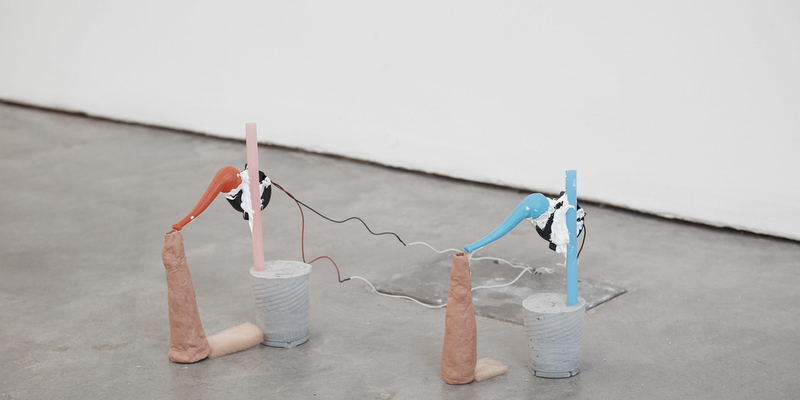 In front of a captivated audience, Nakajima animates her objects, moving them around as their sounds accumulate. Live, the artist’s improvisations are even more vibrant.